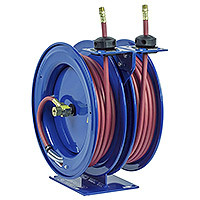 Coxreelsales.com is your complete source for COXREELS hose reels and cord reels. Our knowledgeable sales staff is here to help you find the right hose reel to fit the job and at the right price to fit your budget. Contact us today at 727-835-0673 or Toll Free 800-761-4298. NEW COXREELS "Ship Ready" Reels! 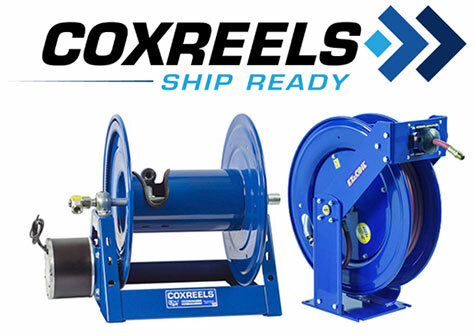 COXREELS "Ship Ready" Program will ship all confirmed stock orders the next business day after you place your order, and if at any time we can ship it the same day, we’ll do our very best to make this happen. You can place the maximum of 10 reels per model per order. All stock orders ship FOB from Tempe, Arizona. For decades COXREELS has been the top choice of hose reels and cable reels for the Aviation Industry because of the quality of their construction and components. Every COXREELS hose or cable reel is individually designed and built to meet the specific requirements of the Aerospace and Aviation industry so you can expect unrivaled fit and function. COXREELS offers a reel to fit the application whether you need a low, medium or high-pressure rating, for grease, oil or air and water. COXREELS hose reels have been the industry standard for decades. 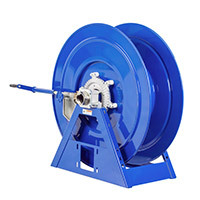 COXREELS manufactures heavy duty professional grade hose reels and cord reels of the highest quality. 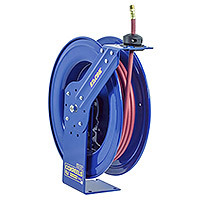 Their comprehensive selection of reels includes spring retractable, hand crank and motorized hose, cord and cable reels and their patented EZ-Coil Safety Series spring retractable reels with controlled rewind. They are the worldwide leader in the reel industry and have been serving customers in residential, commercial and industrial settings since 1923. Their engineering capabilities and manufacturing processes allow them to design and build top quality products for any conceivable application where reels are needed. Entering into their 10th decade under the 3rd generation of family ownership and operation, COXREELS proudly manufacturers the industry's highest quality and widest variety of hose, cord, and cable reels. 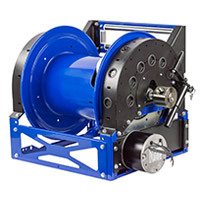 COXREELS Hose Reels and Cable Reels are manufactured in the USA by a group of people dedicated to providing an exceptional product to meet pretty much any application you could possibly have. COXREELS’ impressive facility is up to the latest technology and quality assurance protocols. The production floor management and personnel are very knowledgeable and have a strong passion for what they do. MDI is proud to represent COXREELS and believe you will be very satisfied with your choice in this product. Hose reels, cable reels, and storage reels must be as durable and reliable as the workers who use them. Since 2010, MDI has partnered with COXREELS Reels to deliver custom reels to fit the exacting needs of industry professionals. Whether your industry is Fire Rescue, Aviation, Industrial/manufacturing, Welding, Marine, Fuel delivery, Agriculture, or many others, you demand quality and value in your equipment – and COXREELS delivers.